Meopta is a Czech-based manufacturer of optical goods, which previously included still and movie cameras, darkroom equipment and projectors. The company still makes telescopes, binoculars and microscopes, as well as optical systems for industrial, medical, aeronautical and military uses. The company was founded as Optikotechna in 1933 in Prerov, in what was then Czechoslovakia. Optikotechna used facilities bought from the failing Bradac brothers' company, and the Bradacs themselves worked as designers for Optikotechna and Meopta. It started producing enlargers and darkroom equipment and even its own lenses. During the war, all sorts of optical equipment was being produced for the German military, since the factory found itself in the occupied zone. The first camera was produced in 1939, the Flexette, a 6×6 TLR that was the startoff for what was to become a long line of TLRs. 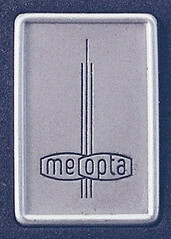 In 1946 the company was nationalized and renamed Meopta. After the fall of communism, it was privatized in 1992. After a period of collaboration with the US company TCI (originally Tyrolit Company, Inc.), makers of optical glass and glass components, TCI became first distributors of Meopta goods in the US, and finally became Meopta USA. ↑ Meopta website, retrieved June 2012. ↑ 2.0 2.1 Company history, also on the Meopta website. ↑ McKeown, James M. and Joan C. McKeown's Price Guide to Antique and Classic Cameras, 12th Edition, 2005-2006. USA, Centennial Photo Service, 2004. ISBN 0-931838-40-1 (hardcover). ISBN 0-931838-41-X (softcover). p149 (Bradac), 761 (Optikotechna) and 662 (Meopta). This page was last edited on 16 February 2018, at 11:26.